Giving away a bobblehead commemorating the moment an opposing player swept you out of the World Series? Sure, the Cubs would do that. 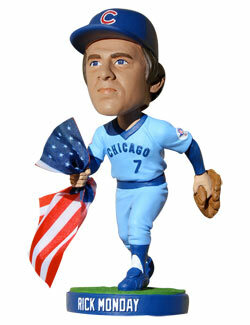 Well, actually, this is a pretty cool bobblehead right here. You can debate whether or not the called shot happened, but it’s part of baseball history. It also happened at Wrigley Field and the 100-year anniversary wanted to celebrate that. 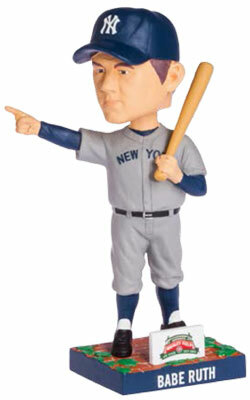 I just picked up the bobblehead and holding a piece of history in bobblehead form is pretty cool. Even though the bobblehead isn’t even of a Cubs player, it’s a great thing to have as a baseball fan. I also have the Rick Monday bobblehead the Dodgers gave away so this isn’t the first time I did pick up a bobblehead like this. It’s pretty cool and I am glad I have this one now. This entry was posted in Bobbleheads, Chicago Cubs, MLB, New York Yankees and tagged Babe Ruth. Bookmark the permalink.